Nipro 3Ml Syringes: Polypropylene Syringe Barrel And Specially Formulated Elastomer Stopper Result In A Smooth, Accurate Motion Along The Entire Length Of The Barrel. Materials Are Inert And Compatible With Delivered Medications. 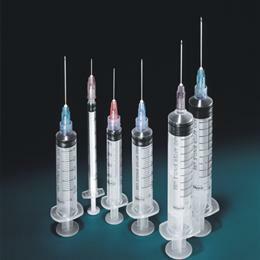 Syringes Are Eto Sterilized And Undergo Automated Inspection To Assure Uniform Quality. Graduation: 0.1Ml (3Ml Total) Syringe With 22 Gauge X 1 1/2" Needle.